The BnB counts a very friendly and welcoming personnel. The house is very cosy and warm, thanks to the fireplace. 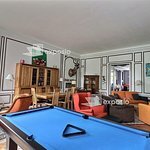 The house is also very clean and you can count on different activities like the pool table or the mini-football to keep busy. Get quick answers from Jacaranda De Banaudon staff and past guests.